Weehawken sits both atop the Palisades and along the bottom of the cliffs along the Hudson River. 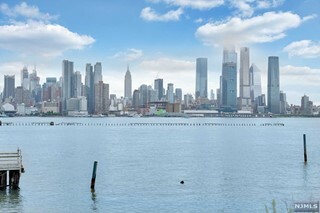 What makes Weehawken so vital is its location at the western terminus of the Lincoln Tunnel and its NY Waterways Ferry Terminal, with direct ferry service to New York City. Thus Weehawken has become one of the main points of entry for New Jersey residents working in New York City. Each day thousands of commuters take ferry service from 2 separate location; The main terminal at Port Imperial and the secondary stop at Lincoln Harbor, at the southern end of Weehawken. Additionally thousands of cars come in and out of the Lincoln Tunnel which divides the town into 2 distinct sections. More recently the waterfront area of Weehawken houses large commercial office buildings as well as townhouse and residential communities in the Lincoln Harbor area. 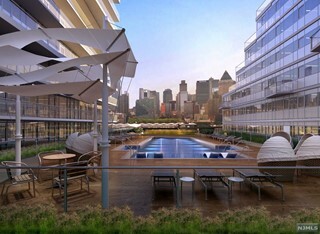 The newest community, The Avenue, with its sensational New York City views and its pricey residences, is presently under construction with a build out over the next several years in 7 separate stages. 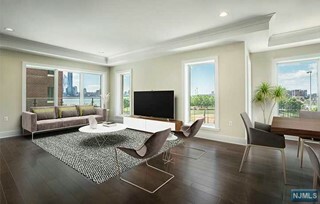 Traversing Weehawken at the top of the Palisades is Boulevard East offering strollers and residents magnificent sweeping panoramic views of the New York City skyline and the Hudson River. At sunset the views are breathtaking. Zoning laws prohibit developers from constructing high rise development that would obstruct any sight lines from the top of the Palisades. The name Weehawken come from the Algonquian language Lenape, spoken by the Hackensack and Tappan tribes that means "rocks that look like trees." This refers to the Palisades atop which most of the town sits. The town was settled by the Dutch and its known history dates back to 1609 when Henry Hudson landed the Half Moon at Weehawken Cove. Settlers moved to the province of New Amsterdam who began to settle the area at Pavonia in 1630 and displaced the existing Hackensack and Tappan villagers . In 1658 Peter Stuyvesant negotiated a deal that purchased from the Lenape all the land from "the great rock above Weihacken", and west to Sikakes (Secaucus.) In 1674 New Netherlands was ceded to the British and the town became part of the Province of East Jersey. Most inhabitants resided atop the cliff as the area along the water was mainly marshland. During the Revolutionary War, Weehawken was a major lookout post of the Continental Army checking the passing of British warships heading up river. The famous residence of Captain James Deas situated on a bluff at the tip of the Palisades at what is known as Peas Point. This ledge, now gone, was the historic site of many post revolutionary war duels that included the most famous one between General Alexander Hamilton, Secretary of the Treasury and Colonel Aaron Burr, who at the time was the third sitting Vice President of the United States. The duel resulted in the death of Secretary Hamilton. Since then, many notables have moved into the Highwood Bluff area surrounding the old Peas Point. During the mid to late 1800's, Weehawken became a transportation center with the West Shore Railroad and ferry service to New York City. The wealthy built massive homes and estate atop the Bluff that included the James King estate, and The Eldorado Hotel a luxury spa resort for the rich and famous that drew huge summer crowds. At the turn of the 20th century, the estates gave way to sub-divisions and the town became more populated and industrialized. Only recently has the waterfront been developed with some of the most expensive condominiums and townhomes along the Gold Coast. 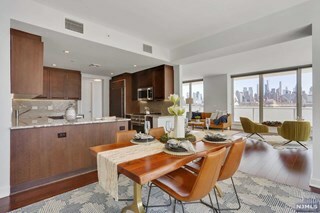 With its easy access by car, bus or ferry into New York developers for high end rentals and condominium living have started huge development projects. Displaying listings 6 - 10 of 62 matching listings. Listing Broker: Smart Realty, Inc.